Summary: Researchers report FMR1 and ZC3H14 proteins both regulate mRNA, which may explain their importance in memory and learning. RNA-binding proteins involved in inherited intellectual disability. The findings provide new insight into the function of FMR1 as well as ZC3H14; the evidence comes from experiments performed in fruit flies and mice. The most recent paper is in the journal Cell Reports, published August 8, 2017. 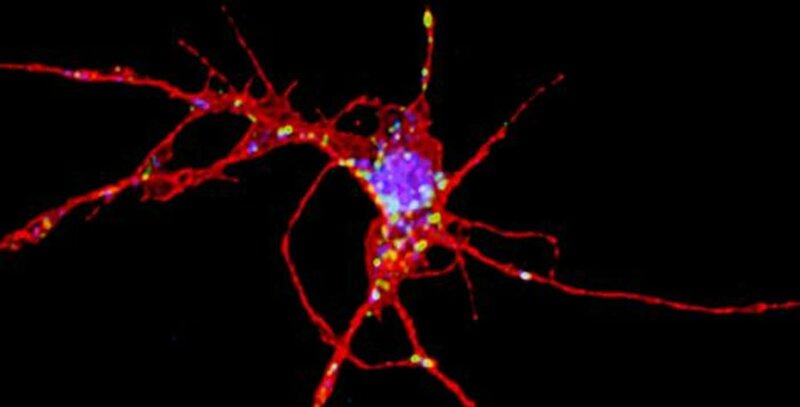 This photo shows a Drosophila neuron, with red representing: neuronal membranes; blue: dNab2; and green: dFMRP. NeuroscienceNews.com image is credited to Ken Moberg. In fruit flies, ZC3H14 is called dNab2. Mutations in this gene were previously shown to hinder flies’ flying and climbing, as well as impair memory formation during courtship. In the new paper, the researchers show that dNab2 mutant flies also have problems learning to avoid situations when an unpleasant smell is present. In this learning task, dNab2 and the fly version of FMR1 are working together, the researchers showed. However, the sets of RNAs they regulate do not overlap completely. “We could not have done this work without the strength of the neuroscience and especially, fragile X, community at Emory,” Moberg says. Corbett and Moberg’s collaboration on dNab2/ZC3H14 was accelerated in 2009 when German and Iranian researchers contacted them about the link to human intellectual disability. It also pushed Corbett, who had first examined Nab2’s function in yeast, into the realm of knockout mice. Her lab’s research on mice lacking ZC3H14, conducted with neuroscientists Paul Garcia, MD, PhD, and Andrew Escayg, PhD, was published in June in the journal Human Molecular Genetics. Funding: Research in Moberg and Corbett’s labs was supported by the National Institute of Mental Health (MH10730501). Image Source: NeuroscienceNews.com image is credited to Ken Moberg. Emory Health Sciences “Insight into Learning via ‘Friend of Fragile X’ Gene.” NeuroscienceNews. NeuroscienceNews, 9 August 2017. Emory Health Sciences “Insight into Learning via ‘Friend of Fragile X’ Gene.” http://neurosciencenews.com/fragile-x-learning-7269/ (accessed August 9, 2017). The Drosophila dNab2 protein is an ortholog of human ZC3H14, a poly(A) RNA binding protein required for intellectual function. dNab2 supports memory and axon projection, but its molecular role in neurons is undefined. Here, we present a network of interactions that links dNab2 to cytoplasmic control of neuronal mRNAs in conjunction with the fragile X protein ortholog dFMRP. dNab2 and dfmr1 interact genetically in control of neurodevelopment and olfactory memory, and their encoded proteins co-localize in puncta within neuronal processes. dNab2 regulates CaMKII, but not futsch, implying a selective role in control of dFMRP-bound transcripts. Reciprocally, dFMRP and vertebrate FMRP restrict mRNA poly(A) tail length, similar to dNab2/ZC3H14. Parallel studies of murine hippocampal neurons indicate that ZC3H14 is also a cytoplasmic regulator of neuronal mRNAs. Altogether, these findings suggest that dNab2 represses expression of a subset of dFMRP-target mRNAs, which could underlie brain-specific defects in patients lacking ZC3H14.